While your air conditioning in your home may not seem like it is complicated to you, the truth is that the system is quite delicate and takes some expertise to understand just how it works. While you may only worry about how cool it keeps your home, it is important that you are aware of the system so that you can detect if something seems to be going wrong. Knowing when something seems off and when you should make the call to a professional service can be important to you. Timing means everything when it comes to the air condition repair in the San Fernando Valley, and waiting too long can end up costing you dearly. If you notice that your system does not keep your home or certain rooms as cool as they should be no matter what you turn the thermostat to, there may be something wrong that needs fixing. You may not give it much of a thought, thinking that since it is still blowing cool air in other rooms or even lightly in some of them that you can just leave things as they are. The problem with doing this is that you can be harming your system, overtaxing it when it needs maintenance. This can lead to bigger issues and even potential breakdowns of the system so it stops working entirely. You want to make sure you call professionals to perform the air condition repair in the San Fernando Valley that you may need. Issues with central units can be tough to diagnose if you do not have a clear understanding and thorough knowledge of both the technology and how the systems work. At American Clean Air and Heating, we have experienced technicians available so that you can get the best evaluation of your system to find out what is wrong. Do not hesitate to make the call for air condition repair in the San Fernando Valley if you think something is wrong. Calling us right away at American Clean Air and Heating can help get your system working correctly again faster and potentially save you a lot of time and discomfort. You can call us at 818-403-3128 to make an appointment with us, and we will get a technician out to you right away to perform the work you need. When you live in Southern California, there is a good chance your air conditioning gets used for a good part of the year. Even if the air is on in the spring and fall, and maybe even sometimes in the winter, it is the summer months where your AC is really going to get a workout and prove itself worthy of your investment in a central system. Just the thought of trying to manage to be in your home for a day without AC can cause stress for you, which is why you need to know of a quality professional service that can help you when something is wrong. Knowing what to expect from professional air condition repair in Malibu will help you to know you have the right service to help keep your home cool and comfortable. Reliability seems to be fading away in the service industry today. Think about all the times you call different services, only to be put on hold for ten or twenty minutes. Maybe you just get an answering machine all the time, but you never get a return call. Sometimes you even contact a service, only to have them not show up on the date they scheduled, or they leave you waiting for hours on end for them to arrive, disrupting your entire day. You want a reliable repair service you can trust, one that answers your inquiries promptly and courteously and keeps their word regarding schedules. Professional air condition repair in Malibu should provide you with expert insight and analysis of the problems you are having. You want a service that has experience and knowledge of all the top brands and models of central systems, so the technicians know just what to look for when there is a problem. The technician should then provide you with an estimate for the work, so you know what to expect before they start repairs. At American Clean Air and Heating, we will provide you with the professional air condition repair in Malibu that you can rely on. We have an incredible staff, from our office staff to our technicians, so that you know you will get the response and help you need when you need it. You can call us at 818-403-3128 to ask questions or schedule a service call, and we will have one of our professionals out to you so that your AC gets running well again. It is in our nature that whenever something goes wrong in our home or in our lives that we want to find the best service possible to help us repair the issue. It does not matter if it is a problem with your car, your plumbing, your lawn, or even your body; you want a specialist that knows what to do, can do it well and is thought of as the best in the field. Approaching your air conditioning should be no different, and it makes sense that you want to go to the #1 rated central AC repair company in Los Angeles here at American Clean Air and Heating for help. 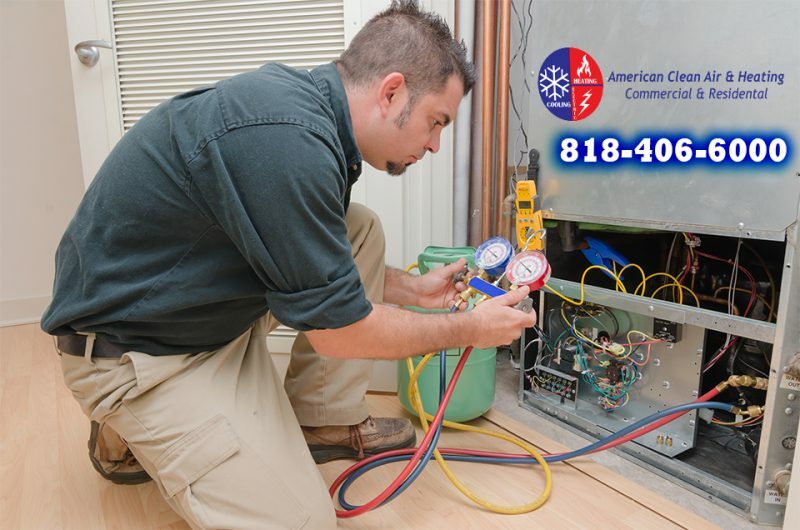 When you call us at American Clean Air and Heating, you know that you are going to get fast and reliable repair work performed. We make sure to get an experienced technician out to you as soon as possible to help you figure out what the problem may be with your central air system. We can diagnose and repair the problem quickly and reliably thanks to our experience and the use of the latest tools and technology. What helps to make us the #1 rated central AC repair company in Los Angeles is that we can provide you with all the repair service you may need for your system. We can work on any of the major brands of central systems you find today to help you get your system running well for you. We provide you with top-notch customer service from start to finish and are always glad to provide you with a free estimate for the work you need before anything is done. 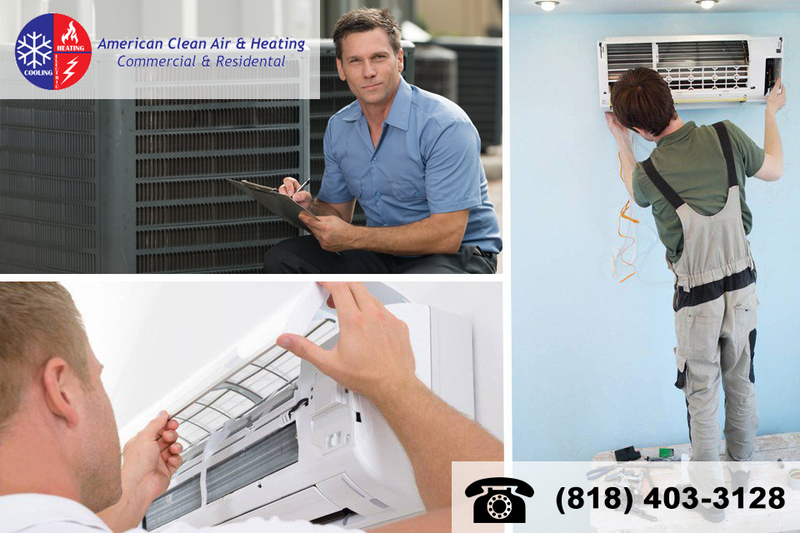 When you want the best repair work for your AC system, it makes sense for you to call the #1 rated central AC repair company in Los Angeles to assist you. 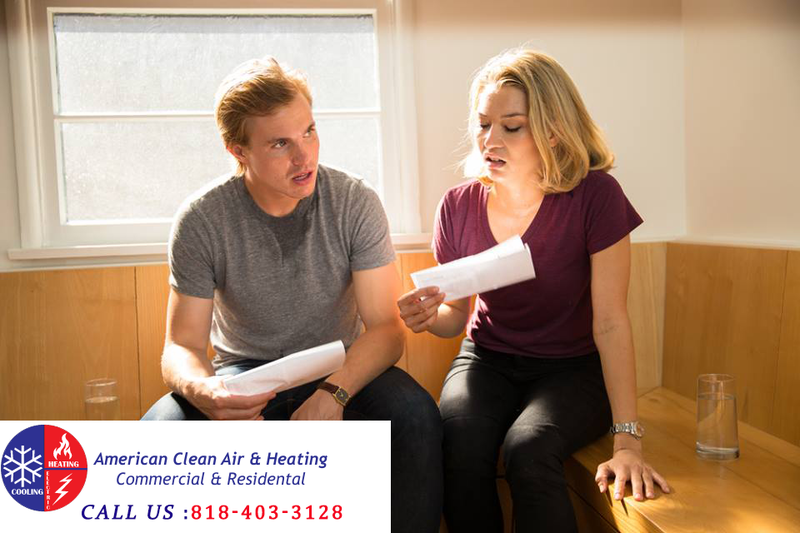 Pick up the phone and call us at American Clean Air and Heating at 818-403-3128 so we can speak with you and set up an appointment for you so you can get your repairs done right. You can also request a free estimate by sending us your message using our contact form. Leave your name and phone number along with your message so we can get back to you. While the calendar pages continue to turn and springtime is practically upon us once again, you may have already dealt with hot days in your home and have been thankful for your AC system each day. Your air conditioning is pretty important to you and your family, and it is difficult to imagine just what you would do if the system suddenly stopped working well or stopped working altogether. As great as it is to have a system to use, you also want to make sure you do all you can to keep it running at its best and that you know what to do when something goes wrong. 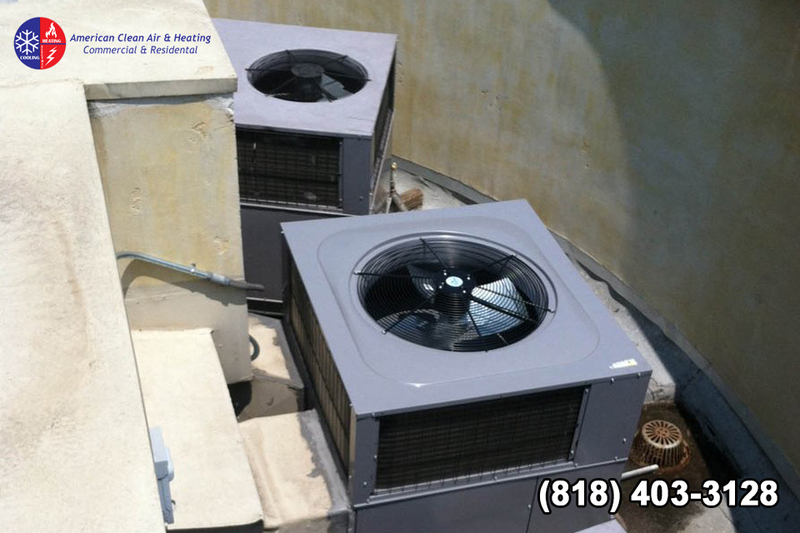 It is always advisable for you to call for professional air condition repair in Altadena when you experience a problem. If you notice that something does not feel right with your AC, ignoring it is certainly not the best way for you to go. If the system seems to take too long to provide cold air, the air never really gets cold, or the system has difficulty getting started, these are all signs that there are problems with the system itself. Hoping they will go away on their own is not a real solution. In fact, ignoring the problem in this way does more damage to your system in the long run and can end up costing you a lot more money. You are much better off addressing the problem right away. 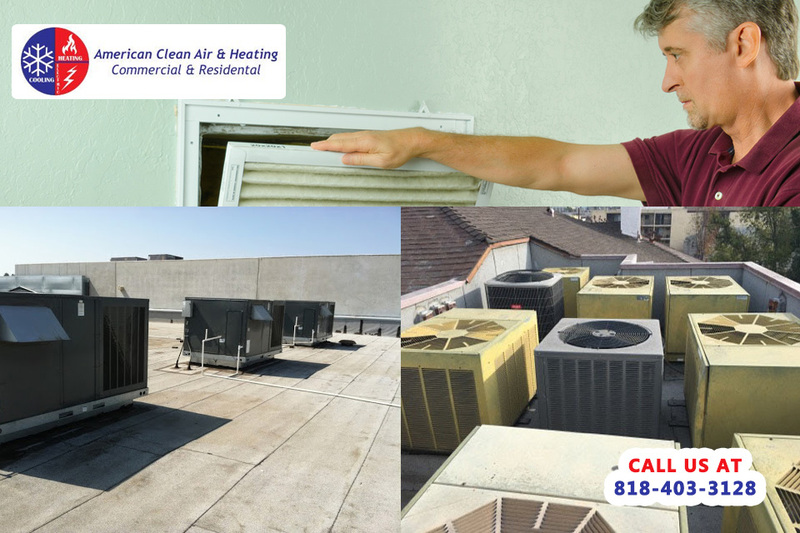 When you are in need of air condition repair in Altadena, it makes good sense to call a professional service like ours at American Clean Air and Heating. We are a fully licensed and insured repair service that has been providing assistance to commercial and residential area customers for years in the area. When you call us for help, you will get an expert technician on site to assist you with the problem. Our experts are highly experienced and can work on all makes and models of AC systems and can provide complete and honest repair and maintenance for you. Do not wait for long to do something about the air condition repair in Altadena that you need for your home. Call us at American Clean Air and Heating at 818-406-6000 and arrange an appointment. We can have someone out to you as soon as possible to start work on your system so you can get an evaluation, a free estimate for the work needed and the fast, reliable service you need right now. You have lots of different appliances in your home, but when you live in Southern California, none may be as important as your air conditioning. There are going to be hot months and then very hot months for you to deal with and if your AC is not working correctly, it can make your life miserable. You will hate the thought of coming home to the hot, stale air each day and opening the windows provides no relief at all to you. 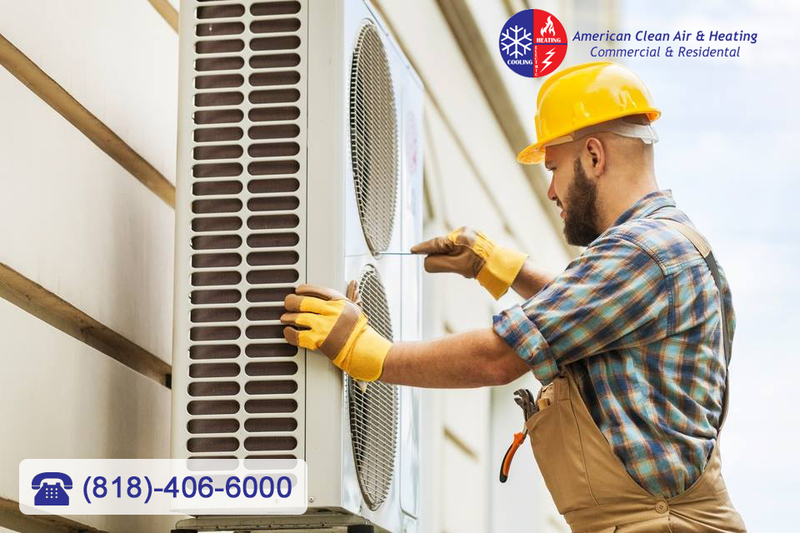 If you experience an AC system breakdown the best move to make is to call us at American Clean Air and Heating for air condition repair in Commerce . Many people may shy away from calling a repair service because they immediately think that if something is wrong with the AC, it is going to be very expensive to repair. While there certainly are instances where repairs can be costly, the truth is that most of the repair work that we perform is very easy and affordable. Often it is just a matter of replacing worn or defective parts to get your system back up and running normally. The repair work may take no time at all and just require a part or two and getting the service performed now is going to be much cheaper for you than what it might cost if you were to have to replace your whole system. Today’s AC systems can be complicated because of the technology used, but our air condition repair in Commerce can provide you with just the professional service you need. Our technicians are familiar with all of the latest systems today and know just how to troubleshoot and repair your air conditioning so that they can get it working properly for you. Professionals can quickly analyze things for you and do the work in much faster time than someone that is not expert in air conditioning, and you will be sure the job is done correctly the first time around. 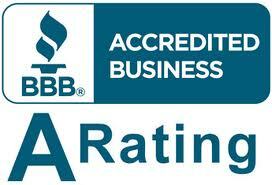 If you are in need of air condition repair in Commerce, call us at American Clean Air and Heating at 818-406-6000. We have over twenty-five years of experience working in the Los Angeles area and have helped thousands of customers like yourself repair and maintain their AC systems. We can help you get your AC working right again, so you do not have to suffer through hot days.